You must be a member of the Madrid Basketball Group to attend this activity. Would you like to join this group? We have a great opportunity to invite you to watch one of the important games of the Euroleague, and be able to enjoy this show together with other members of Internations Community. It is a group stage of competitions. 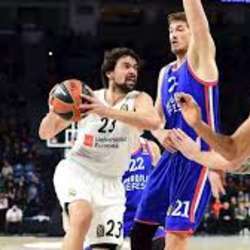 The old Rivals, Real Madrid and Anadolu Efes will meet again to dispute their chance to win the Main Trophy of these Competitions. We will watch this game on TV in a bar. Please check the location on the map. If you are able to join me for this event, please sign up for this event, and send me your contact number via WhatsApp, message to the number I leave here, or just write me it via private message on Internations. Look forward to meet you and share the Beautiful Moments of the Game with you!